For almost as long as I have been fly fishing the Wickham’s Fancy has been a favourite of mine. Rainbows used to love it and brownies accepted it willingly either as a small dry or the wet version, especially in the evenings. Sea trout fell for its undoubted charms too and it could frequently be found on my cast on those far off halcyon days of my youth as I fished the ADAA Pots and Fords water on the lower Dee. The only issue I have ever had with the Wickham’s is the wings. The blae wings, made from paired slips of Jay or Starling, always looked lovely on newly tied flies but by the time they had caught one or two fish the wings had become a shapeless mass of broken fibres, even though the rest of the fly was in perfectly serviceable condition. I thought it was high time I made efforts to address this issue. As well as giving the fly a new wing I decided to use Fire Orange tying silk (a common addition these days). Leaving a few turns exposed at the end of the body as a sort of tag and clear coating the turns of silk at the head gives not one but two aiming points for the fish. 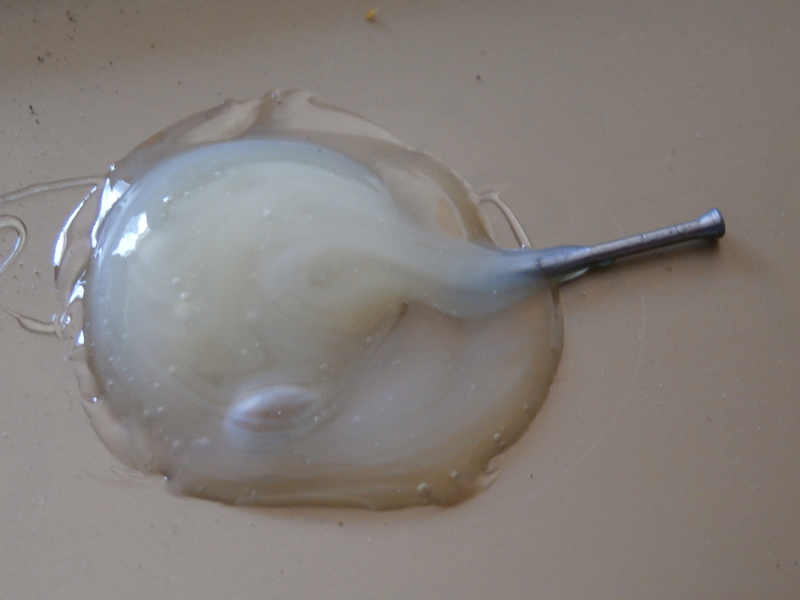 The rest of the dressing remains the same until we get to the wing. Here I was looking for a strong material which could take a good deal of punishment without being too stiff. Squirrel tail hair, unbleached but dyed olive, fitted the bill nicely. I aimed to keep the wing quite slim so there is some movement in it. I will give this one a swim when I am next in a boat fishing for trout. I came across an old cardboard box in the shed with some fishing related odds and ends inside. There was my father’s old tackle bag for a start. I washed and dried it and it will give me some more years of service even if it is a little faded. A filleting knife from an Aberdeen fish house was in there too and I can bring it back to good condition with a little elbow grease. These knives were wonderfully flexible and easy to sharpen so it will come in useful later this year when the sea fishing picks up and I have some Mackerel and Pollock to fillet. Then there was a small bag containing my long lost repair kit for rods. 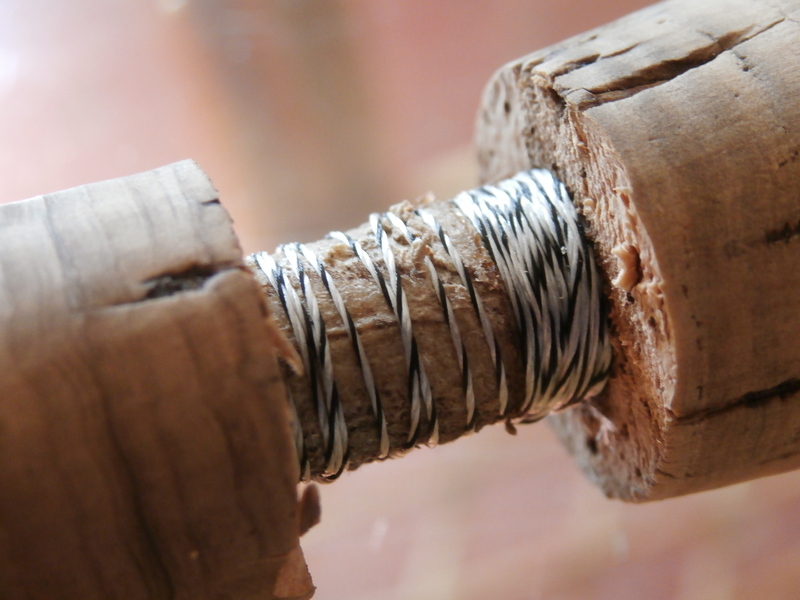 A spare reel seat, lots of whipping threads, hot melt glue, some rings and a few corks. Now I have been looking for these corks on and off for a year or more as I have a Hardy fly rod which is out of commission due to a broken handle. So this morning I set about using my newly rediscovered goodies to repair said Hardy. The rod in question is a ten foot six, 3 piece Sirrus which I used for grilse fishing. It had accounted for many, many fish but was in good condition until the third cork from the top of the handle gave way. Any other cork would have been only a cosmetic issue, but this one is directly where my thumb sits when fishing so the rod effectively became useless. It has been gathering dust for 2 seasons now and its replacement (a meaty Diawa 11’3) is now my preferred rod. I started the repair by cutting off the broken cork. As soon as I had done that the source of the problem became evident, there was a layer of filler which only extended half way up the broken cork meaning it was not fully supported. This is very shoddy workmanship and it is so disappointing that Hardy have let their previously high standards slip since production was shifted to the Far East. 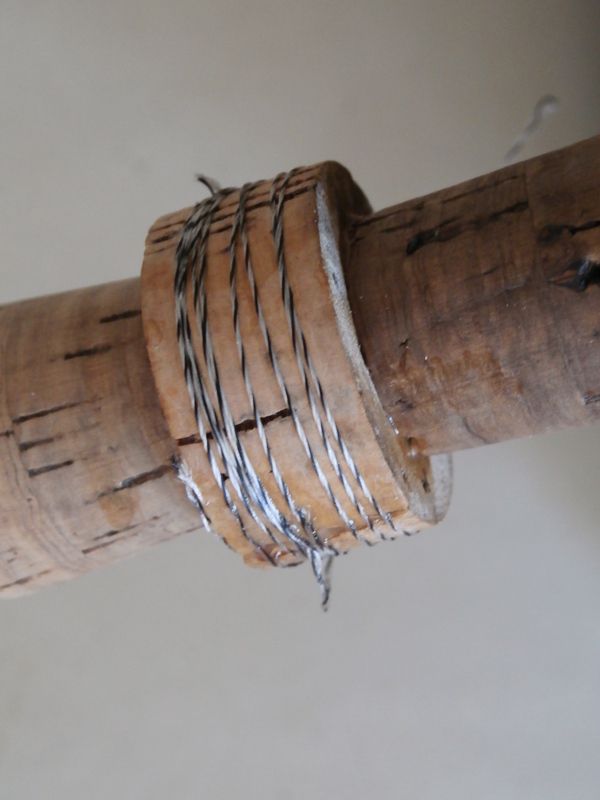 Next I cleaned up the exposed area of the rod blank and wrapped the whole are with silk to provide an even base. This was an awkward job but it is vital that time was spent making sure I didn’t repeat the same mistake as before. Next it was time to get messy. 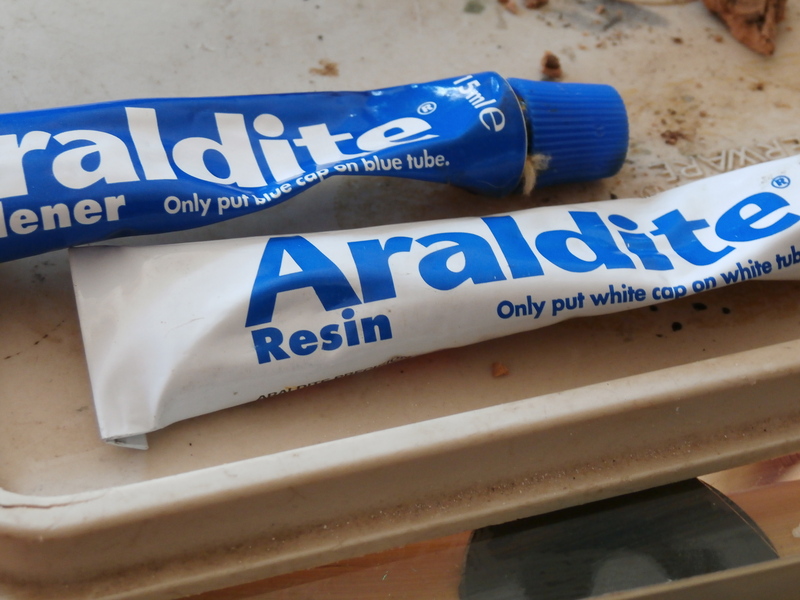 Araldite was mixed up into a milky gloop and then spread on the new whippings and the exposed ends of the corks on either side of the gap. An appropriately sized cork was split into 2 and the faces given a light coating of Araldite before being carefully positioned. I then secured them tightly in place using some more whippings. The excess glues was wiped off and the job set aside to dry before I shape the new cork to match the rest of the handle. At the very bottom of the old cardboard box I unearthed my fishing wallet. Dating from the early ’70s this cheap brown leather wallet accompanied me everywhere in my formative fishing years as it held that most precious of documents – my ADAA fishing licence. The Aberdeen and District Angling Association (ADAA) controlled most of the fishing in and around Aberdeen so when my application to join as a junior in 1974 was accepted my fishing setted into a new world of possibilities. No. 1328 made the maximum use of these opportunities and I learned how to fish on the hard pressed waters of the Don at Parkhill and the wonderful Machar Pool on the Ythan. 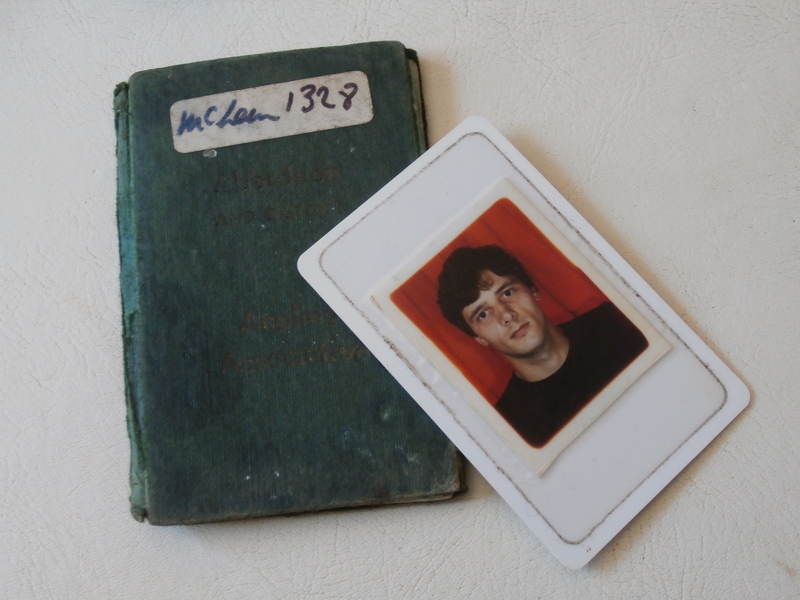 When I became a full member on reaching the ripe old age of 18 I was issued with a photo ID card. Where oh where have all the years gone? Finally I came across numerous small tins of humbrol paint which I used to paint devon minnows. Unbelievably some of these are still usable after 35 years! I will give some of my baits a tidy up with this new found treasure during this spell of bright, hot weather when there is no fishing.